Industrial PC Pro, a leading industrial computers integrator and solution provider, introduces the latest IMBA-Q770, an industrial ATX motherboard from IEI Technology. It supports the 22nm LGA1155 3rd generation Intel® Core™ processor family and Intel® Q77 Express Chipset. 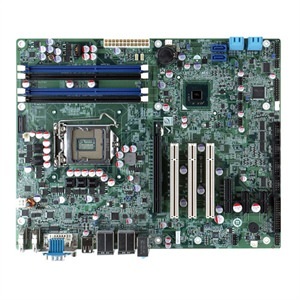 Integrated dual HDMI and DVI-I on the Intel® Q77 Express Chipset and Intel® HD Graphics with DX11 support allow this advanced motherboard to deliver enhanced graphics performance and support three independent displays with an additional VGA connector. With USB 3.0, PCI Express generation 3.0 and a SATA 6Gb/s port, the IMBA-Q770 excel in data and video transmission for remote security and manageability. The IMBA-Q770 is an ideal platform for high performance surveillance systems, the gaming industry, public infotainment, and high-resolution digital signage applications. The IMBA-Q770 is a standard ATX motherboard which support advanced 22nm LGA1155 3rd generation Intel® Core™ processors. The board supports three independent displays, quad/dual core Intel® Core™ i7/i5 processors, and dual-channel DDR3 1600/1333 MHz with maximum support up to 32GB. The IMBA-Q770 has three PCI slots for flexible expansion for high-speed networks. The Intel® Q77 Express chipset supports state-of-the-art Intel® Active Management Technology (Intel® AMT) 8.0. IT managers can remotely diagnose and repair problems using Intel® 82579 PHY for Intel® AMT 8.0 support. Based on the Intel® Q77 Express chipset with Intel® AMT 8.0 support, IEI developed iEZman and One Key Recovery to combine the power of remote KVM control with simplified system recovery and backup management. All IEI products can be remotely controlled using IEI's iEZman and One Key Recovery.